Ink Factory is all about empowering people to communicate and organize their ideas better using the visual language. And creating good visual notes doesn’t mean you have to be a good artist! 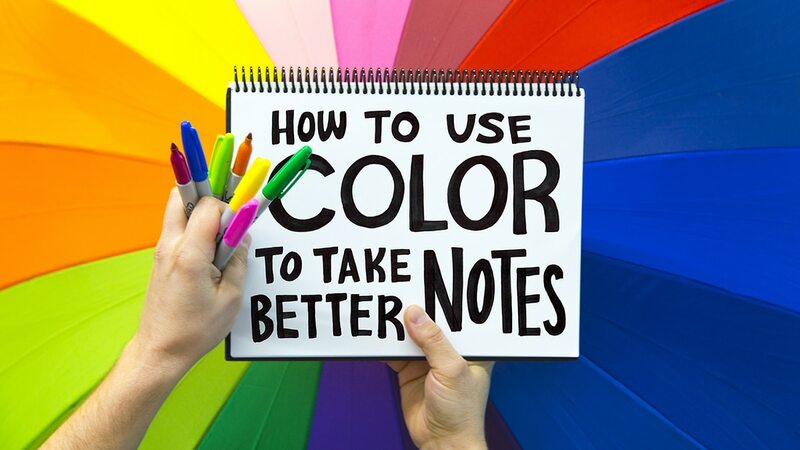 In fact, simply by using color, you can create well organized and easy-to-understand notes using no pictures at all. Whether you want to stay focused during a presentation, remember more information during a class lecture, or explain your ideas more clearly in your next pitch, having color in your visual tool belt will make all the difference! 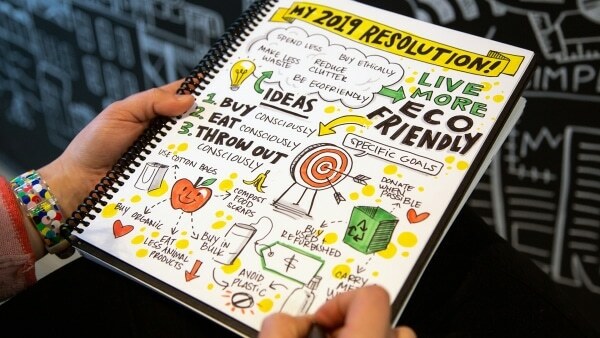 If you’ve read our guide on creating your first visual notes, you’ll know that establishing a hierarchy of content is key to communicating ideas visually. More important points should stand out on a page, and less important points should recede. There are many ways color can enforce this content hierarchy to make your visual notes easier to read. Contrast means the difference between lightness and darkness in parts of an image – pure black and white is the highest contrast you can achieve. Two greys (or other colors) of a similar lightness and darkness next to each other would be considered low contrast. All colors have both a level of brightness (contrast) and saturation. A dark blue may be vibrant or muted, and a vibrant pink might be light or dark. Since most of the time we draw visual notes on a white background, we consider how much contrast a color has against white, compared to the other colors around it. Large areas of highly contrasting colors will draw the eye to them before areas with low contrast. As you can see in the example below, a large, bold title in black and white ink brings the eye to it first (as it should, since it’s the title!). The version of the same talk on the right shows you what a low-contrast title would look like. There will also be times when you might want to put less emphasis on information so you don’t distract from the most important content. In this visual below, detailed points are written in a light red. Red contrasts less with white (the background color) than black (the title color), so the title still stands out from the rest of the visual. Saturation means how brightly pigmented a color is. Highly saturated areas of color will draw the eye to them, and take away attention from less saturated areas. In the visual note below, the title is not that large or bold, however because it’s highlighted with bright orange, it’s easier to pick out of the rest of the content. A visual where colors are used consistently are easier to read than ones where color has no meaning or purpose. Before creating your visual, assigning a color to certain levels of importance can help keep your image organized. In this visual, you can clearly see that key concepts are delineated with a large red writing, and more detailed information is in smaller, black writing. 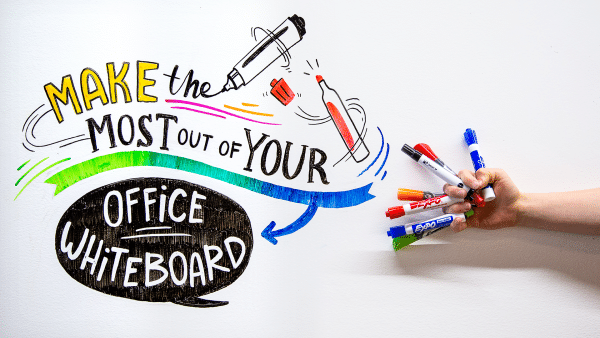 When creating your visual notes, selecting just one color for your key points will help you stay organized. 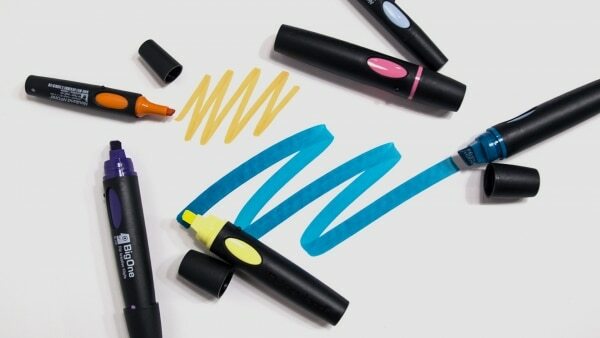 When we create visual notes, we choose colors based on a variety of factors. Sometimes our client’s branding guides our color choice, other times it’s the topic of the talk. We tend to gravitate towards certain colors for different topics. You can also directly tie the concept or mood of the talk to your color choices. See how the talk on the left about gender as a spectrum uses not just pink and blue, but the range of colors in between to represent the spectrum of gender, and the talk on the right about the prison system uses drab grays and bright orange to reflect prison jumpsuits. Consider the content of the talk and think about colors you associate with that talk. Select your color palette. We recommend no more than 2 colors in addition to black. Decide what color will be your key points, and what color will be supporting. A more contrasting and saturated color will work better for your key points, and a less contrasting and desaturated color for supporting points will make your key points stand out. Draw the title of the talk using high saturation and highly contrasting colors. Once your title is done, start the talk and begin note-taking! Take a look at your notes. Are the colors helping you differentiate between different points? Are the main takeaways and key concepts easy to spot? That’s the beauty of color! Share your visual notes with us on Facebook, Twitter or Instagram using #ThinkLikeInk.